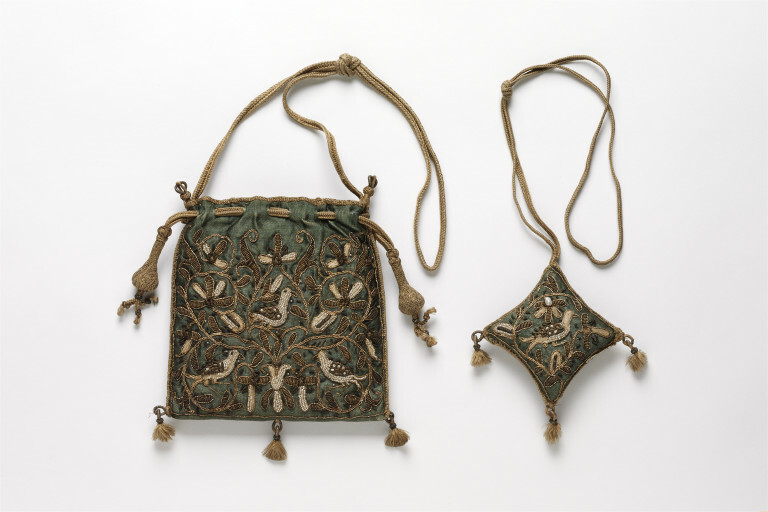 The purse and pin cushion are made of satin and embroidered in a pattern of birds and flowers with silver thread, silver-gilt purl (tiny tubes of tightly coiled metal) and freshwater pearls. Both purse and pin cushion have a string of flat braid of beige silk, to attach them to a belt if required. Flat and square bag and separate pin cushion of blue silk satin hand-embroidered on both sides in a pattern of birds and flowers with silver and silver-gilt thread, metal purl and freshwater pearls. The bag is lined with brown silk. 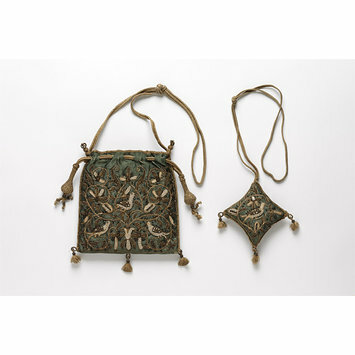 The bag and pin cushion are trimmed with flat braid and finials of beige silk and silver thread. Draw-sting of silk braid. Padded.